This Christmas I received a wonderful gift. The kind that I will treasure forever. My mother-in-law gave me these beautiful crystal glasses that use to be her moms. I was elated because while I was in Paris, I bought a beautiful crystal decanter. This set of 6 glasses go beautifully with the decanter. I love simple elegance and that's what this set is! My oldest daughter was excited because she was named after her great grandma. I found the decanter while I was at the flea market in Paris. It didn't have a stopper so I had to find that separately. I managed to find one that fit perfectly that same day. My mom gave me the wonderful crystal candle holders for Christmas. The beautiful thing is that you can use them for other things too like jam and butter. Don't you love the way the crystal reflects these prisms. It makes the whole room sparkle. These are the gifts that I will pass on to my children. Thanks moms for thinking of me and passing on your beautiful treasures. I'll take good care of them and USE them!! 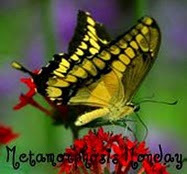 I'm linking this post to Between Naps on the Porch Metamorphis Monday.